The MLS Fantasy season is closing with unpredictability, and that means it's a perfect time to roll with a differential at captain. Week 32 may have been the weirdest yet, with a lot of unfamiliar faces leading the way in Sebastian Blanco, Saphir Taider and Fafa Picault. Sure, Wayne Rooney and Nicolas Lodeiro weren't far behind, but none of my top options did anything and they were all in ripe matchups. Sebastian Giovinco, Miguel Almiron (injury), Josef Martinez, Luciano Acosta and Carlos Vela combined for 18 points, the same amount as Blanco. I thought it was an easy week to pick a captain and then it turned into a mess. But while it could be a great time for a differential, there are only four matches in Week 33 due to the international break, and that means there are only four ways to go for the armband. LA FC (v. Houston), Minnesota (v. Colorado), D.C. (v. Dallas) and New England (v. Orlando) are the only logical places to look. If you want to be illogical, Dallas haven't lost in their last five matches and if they score, Maximiliano Urruti would likely be involved. Of course, if he doesn't score or assist he may only get two fantasy points, and that's the risk you take. 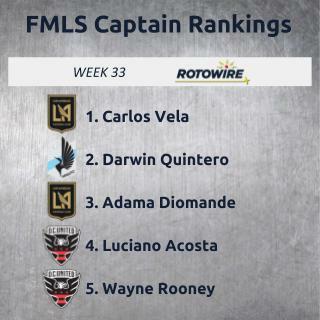 Vela is the obvious top captain even though he just flubbed at Colorado. He has double-digit upside and if all goes wrong for LA FC, he'll still be near five fantasy points. The better news is that Houston are out of the playoff hunt and were dominated by Seattle on Monday, so it's a long road trip for them. If you don't want upside, Lee Nguyen is waiting for the armband, but the ultimate differential would be to go Adama Diomande after he bagged a brace last weekend. If he's back in mid-season form, he could easily surpass Vela on the score sheet. Minnesota have scored five goals in their last two home matches, and the only player to look at is Darwin Quintero, who has a goal or assist in his last four starts. Home against Colorado is as good as it gets, as it's almost a free win. The Rapids have lost their last seven matches by a combined 22-1 score line. At times like this, it's a wonder when relegation will be implemented. If you prefer the differential route, Angelo Rodriguez isn't far behind Quintero after scoring a brace last time at home. This is a good spot for a clean sheet, but I'll leave it up to our MLS rankings expert to decide on the best Minnesota defender. D.C. aren't in a great spot, yet they're fighting for the playoffs and have scored 16 goals in their last six at home. Dallas are at the top of the table, but they will be without a few players like right-back Reggie Cannon and defensive midfielder Carlos Gruezo. United are missing a few guys, yet none of them should change the team's form as Rooney and Acosta are the main guys to know. I've been on Acosta the last couple months, but it's hard to ignore Rooney's five goals in the last three matches. That being the case, I'm still keen on Acosta because Rooney is the more popular fantasy play of the two, and if Acosta goes off and Rooney flops, you're more likely to benefit against the general public. The last matchup is between struggling sides, and Orlando are also in the should-be-relegated camp with three points in their last 11 matches. Those numbers are even worse on the road, failing to score in their last three and losing the last nine by a combined 26-8 score line. Unfortunately, the Revs don't have anyone you can trust since Diego Fagundez is now coming off the bench. It's a toss up between Teal Bunbury, Luis Caicedo, Juan Agudelo and Cristian Penilla. If you can pick the best player between them, I applaud you. I'm going with Penilla, but not as my captain.